Experience the transformation from a “caterpillar into a butterfly” in activating one’s imagination, extrasensory abilities and creativity in everyday life through multidimensional “GEMS” presented in this masterful guide book. Once in a while someone comes along who can see into your thoughts…your deep thoughts…things you wonder about. How do these things happen? And why? Dorothea Joyce’s stories are for parents as well as children. She will amaze you and enlighten you with her memories. Dorothea reaches out to teach you, that you can really know what it is to be truly alive by acknowledging all that you see around you, as you discover the “secret world” within the world. Dorothea’s book speaks to and awakens the creative genius within all of us. In our fast paced lives filled with over-stimulation from life and the media, this is the kind of work that develops and opens the minds of our children, directs them to the rich world within them, and helps adults remember that the fullness of their Spirit is alive and accessible! 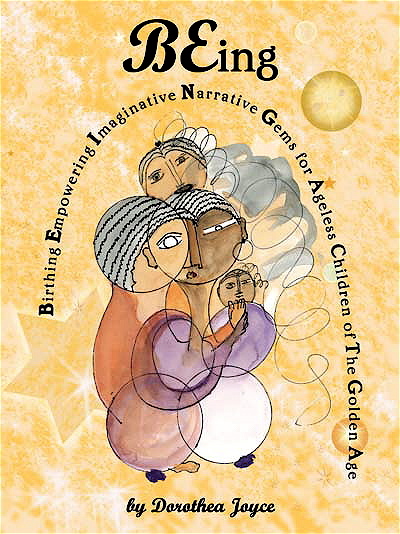 Dorothea Joyce’s magical book, BEing, gives the gift of sunshine to the Children of the New Earth. It is filled with wonder, questions and musings as seen from the Eternal Child within all of us. Dorothea is the consummate cultural creative – musician, author and artist – she is a gift to us all in her own BEing. BEing is a wonderful book which presents the opportunity to read and work with children of all ages… (and especially those gifted ones who realize that we are all connected) ..by utilizing offerings of creative projects, songwriting and visualization interactions. BEing helps us remember together – and to remind one another – of the true gift of being alive within us at this amazing time of humanity’s spiritual evolution! I can’t wait for the next book to come out!